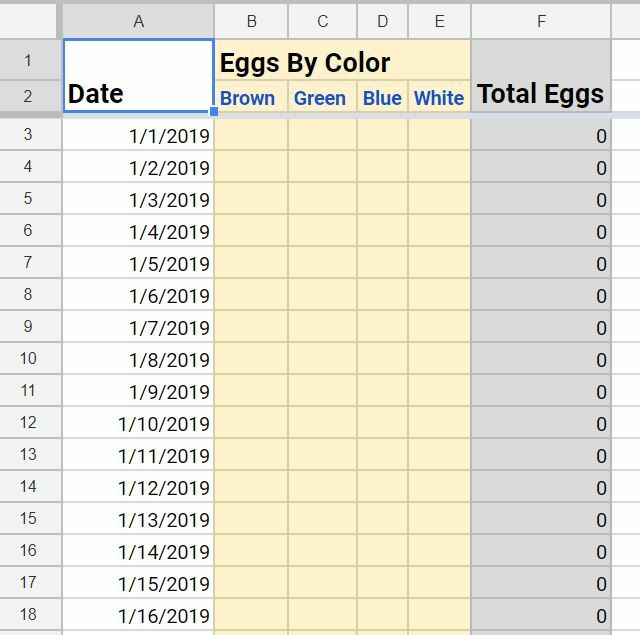 We may already be a week into 2019, but it is not to late to start tracking your home chicken egg production with this easy spreadsheet. 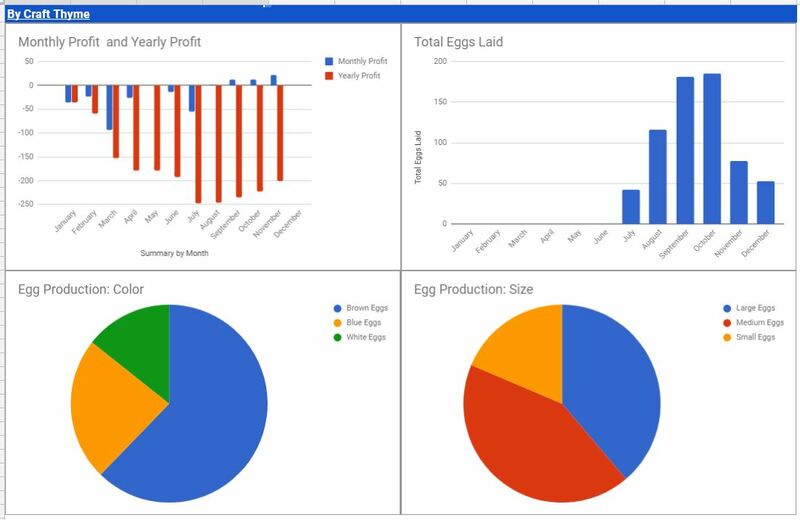 In 2018 I released a version that allows you to track your chickens, egg production, sizes, colors, income, and expenses. Everything the home chicken hobbiest might need to keep their flock’s statistics. 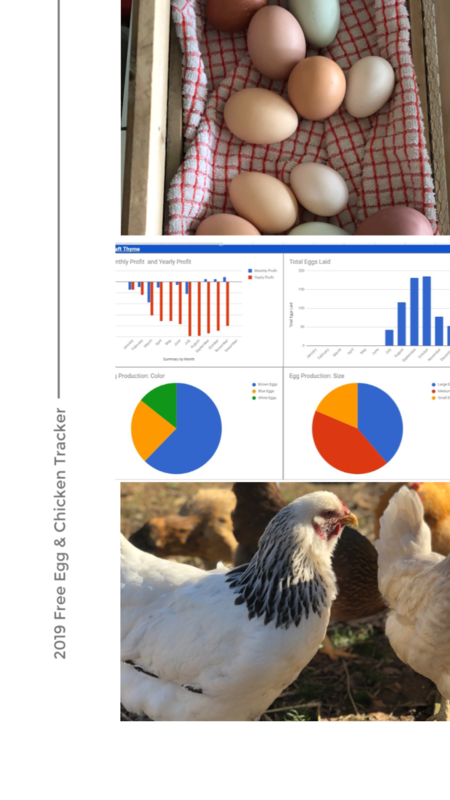 I’ve made some tweaks and am now happy to offer another free egg and chicken tracker for 2019. This way everyone can keep up with how deeply in the hole their chickens are taking them :). Let’s not discuss the profit portion… Hobby right? Might also help if we didn’t eat so many eggs. Added XL eggs. Apparently some of you are all fancy and actually measure and grade these eggs out. For you I added the calculations for XL eggs in all colors! Created a separate sheet for the lazy in us. It is a pared down version of the larger tracker for those that just want to track some basics. Tell us more about the Easy Tracker! So you want to know more about the simple egg tracker? Well I took out the sizing, as I heard many people did not weigh their eggs nor did they want to guess the size. I left in color, but you can skip that entirely and just put in a total. It also removes a chart and shortens the summary. You still get all the totals, averages, and goodies. So How do I Use the Free Chicken Egg Tracker? I made a pretty good guide on how to use the tracker in 2018. It still works just click that link! Also there are some details and release notes inside the first page of both trackers. Great I’m Sold! How do I get it? I sure hope you are sold on this egg and chicken tracking spreadsheet because, well, it is free! No catch, I just like making utilities for myself and if others find it useful then great. Click on the links below and you will be prompted to make a copy for yourself. As usual if there is enough demand I will consider making this in Excel or a printable pdf version. All I ask for payment is that you share this post if you think others can use it and let me know your questions, comments, and ideas for improvement in the comments below! I’m testing it out now and think it will work really well for my small backyard flock. Thanks to Brianna as well for mentioning the formula on the laying hens, as I created a 2018 log as well as a 2019 log and that enabled me to get accurate data. I started my flock in July 2018 and wanted to track my startup costs and production. Pretty slick – thank you! Glad you are enjoying it. I want to develop a multi-year log. Just haven’t quite set up the time to do it yet. Thank you so much for posting this! I was in the process of creating my own spreadsheet to track everything when I stumbled across yours. Just a heads up, the Laying Hens formulas on the Summary Statistics tabs of both 2019 spreadsheets still reference 2018 dates so it wouldn’t pull the Lay Date information from the Chicken Log tab. Once I updated each formula to reference 2019 it worked beautifully. Thank you so much! Sorry about that! It is all fixed now!